Spending a wonderful escapade with the whole family on the lake can create memories that will last a lifetime. The Tri-lakes area is considered by many vacationers as a great place to enjoy outdoor fun in Branson. As boating is one of the premier water sports adventures in Branson, many of the boating enthusiasts who don’t own a boat, can actually enjoy the best boating adventure as they have the chance to avail boat rentals that they can find at State Park Marina, Lake Taneycomo Boat Rentals, and at Indian Point Marina. State Park Marina is a beautiful area resort at Table Rock Lake that offers the most water sports activities in the Midwest. This marina is home to the Boathouse Boutique store, a full-service Dive Shop, Danna’s BBQ, and new ‘Oasis’ Hawaiian Shave Ice. The boathouse at State Park Marina features everything you need for your boating adventure, from snacks to sunscreen, disposable cameras, batteries, sun block, towels, apparel, fuel, bait, fishing gears, tackle and a wide selection of drinks and snack items. Conveniently located inside Table Rock State Park off Highway 165, State Park Marina offers the most water sports adventures on Table Rock Lake in Branson. The marina has got everything on the water, including boat rentals, parasailing, scuba diving, bass fishing and daily cruises on The Spirit of America, a 48-foot sailing catamaran. For your boating adventure on the lake, you can rent different kinds of boats at State Park Marina such as wave runners, ski boat, pontoon boat, bass boat, and much more. Lake Taneycomo Boat Rentals offer a safe, clean, easy, and reliable boat rental service. Why make a headache of bringing your own boat to the dock, hauling it in, and loading it back. At Lake Taneycomo, you can rent different kinds of boats such as Jon boat, bass boat, and pontoon boat. You can also easily grab a bait, tackle, snacks, and drinks at the same spot. If you want to experience a rugged boat adventure, try water craft with paddles. Boat rental marinas at Lake Taneycomo include Lilley’s Landing, Trout Hollow, Edgewater Beach and more. In these marinas, you can also rent a small yacht, sailboat or bring the kids tubing down the same lake shore. Indian Point Marina is another full service marina in Branson that offers numerous amenities. 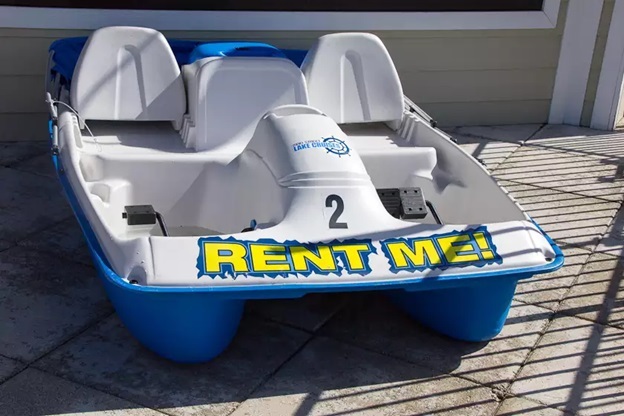 As a vacationer, you will be pleased with their wide selection of rental craft which includes tri-toons, pontoons, deck boats, skiboats and waverunners. This marina also has a gas and pump station, a tackle store complete with live bait, fishing licenses and tackle, groceries and camping supplies. There’s no need to worry about when you are hungry as the marina features a floating café that offers full menu for breakfast, lunch and dinner available in the climate controlled dining room. So, if you want to experience the best outdoor fun in Branson, try a boating adventure on the lake and create memories that will last a lifetime.